Hildene is a Georgian Revival Style home situated in the pretty town of Manchester. Construction of this 24-room home began in 1903 and the Lincoln family moved in on June 20, 1905. 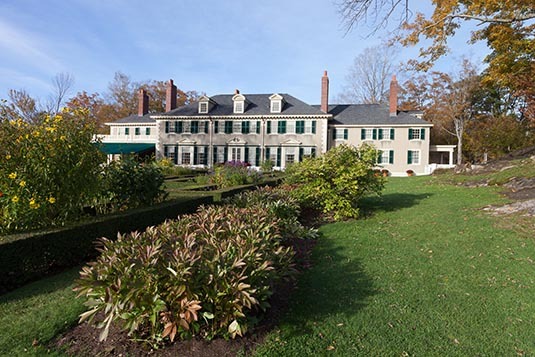 Robert Todd Lincoln built Hildene as a summer home at the turn of the 20th century. Robert's father was born in a log cabin and called from the humblest rank in life to preside over the nation during the most momentous period of its history. Robert was the only child of Abraham and Mary Todd Lincoln to survive to maturity. Robert first visited Manchester as a young man in the summer of 1864 when he came to the Equinox Hotel with his mother and his brother Tad. He was so taken by the beauty of Vermont that some forty years later he returned to purchase 500 acres of land to build what he would call his ancestral home. At the time, Robert was president of the Pullman Company, the largest manufacturing corporation in the country. 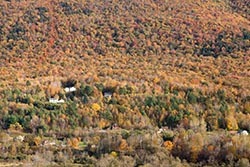 Hildene was an hour's drive from Killington Mountain Resort. The massive estate offers many tours to visitors and there are walking trails as well. You would need at least a day to truly enjoy the grandeur of the home and its surroundings. I only had an hour with me... just about enough to visit the home's many rooms, view the period artefacts including the grand piano (still in working order) and then step out into the Hoyt formal garden. 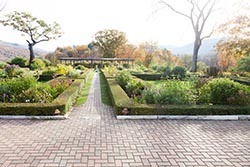 The formal garden was designed in 1907 for Mary Harlan Lincoln by her daughter Jessie. Her design was influenced by French parterre gardens she had seen while the family lived in Europe and she wanted the garden to resemble a stained-glass Romanesque cathedral window. The panes of colored glass were produced by different colored flowers and privet hedge was planted to represent the leading between the panes. In mid-June, over 1,000 peony blossoms from original plantings fill the garden with color. In October, however, the mountains around are painted with magical fall colours. Further down the estate is a coach - completely refurbished like its original. The Sunbeam was built by the Pullman Company as a 10-section luxury car in June 1888. The car’s original name was Ortega and was built for the Pullman – Southern Pacific Association. It was used by President McKinley until his death in 1901. In June 1903 Pullman rebuilt the Ortega and four others as private cars for Pullman charter service. With the rebuilding done, the Ortega was renamed Sunbeam. Hildene bought the Sunbeam in the summer of 2007 and it was restored in South Carolina. 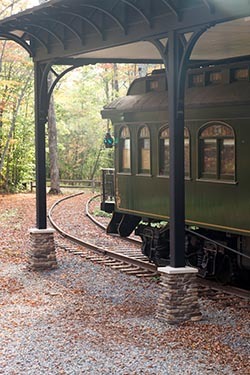 In its new home at Hildene, Sunbeam is the finest example of a wooden Pullman car on public display. It was closing time. I had no option but to move on to Arlington which was only a short drive away. I was hosted at Arlington Inn by Elizabeth Berger. She and her husband make for a good team – while she is a good administrator, her husband is a fantastic cook which I realized during dinner that evening and at breakfast the next morning.